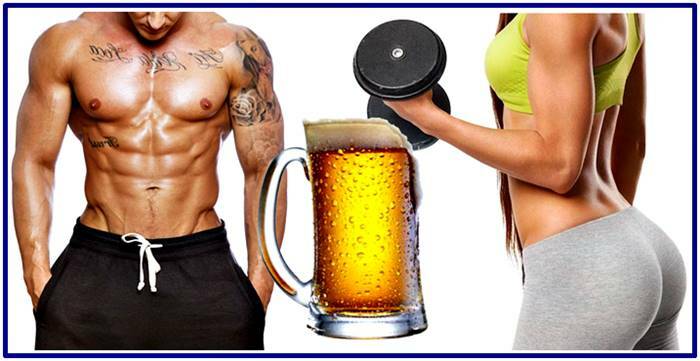 Home beer and muscles muscle atrophy muscle hypertrophy muscle recovery Drinking beer after your workout is good or bad for your muscles and health? Drinking beer after your workout is good or bad for your muscles and health? Drinking beer after the weight lifting routine will affect my muscle growth? Is Healthy Drinking Beer After Exercise? How many beers can I drink if I go to the gym? Usually it is men who most wonder if drinking beer right after completing your workout routine with or without weights has some positive or negative effect on body's overall muscular growth and recovery (taking into account also the nervous system and others organs and tissues) and of course if it affects or possibly contributes to increased muscle mass (muscle hypertrophy). READ: Is it better to dirnk protein shakes with milk or water? Is drinking beer after exercising good or bad? Well, actually the title question of this article should be: Is drinking alcohol after the weight training routine good or bad? Why? Because there are simply non-alcoholic beers, and since brewer's yeast often contains good amounts of B-complex vitamins, and the beer itself has a calorie intake not too high per bottle. Then in this case beer would have some benefits when exercising, so it would be good somehow as a post workout drink. But the main facts that many men want to know, and also some women, is whether to consume Alcohol after exercise can negatively or positively affect the results of their daily training hours, or indeed if there can be an immediate negative effect, such as for example if is possible that consuming large amounts of alcohol could cause some degree of muscle atrophy. Well, before mentioning the data from studies that evaluate the consumption of alcohol related to the inflammatory responses and recovery of the body after an exercise routine, it should be mentioned that it is very rare for someone to want to have a glass of whiskey, vodka, Tequila or other "pure" and "strong" liquor, just after exercise. And in those cases is when beer shows up as the main drink that many people want to take after a high or low intensity training session, especially for thirst, because it is a drink with a high amount of water, because in addition it is usually served cold and because its flavor is usually very pleasant to the taste of many. For this reason it is very rare that after finishing the workout routine (taking into account the dehydration factor) someone would like to have a glass of vodka, or quench thirst with a pure whiskey or a "tequilazo" even when supplemented with lemon. That is why sometimes they do want to finish the training with a cold beer. But, well, in the studies that I will mention, we talk about the consumption of alcohol, more specifically of ethanol, after exercising. NOTE: we are talking about pure alcohol, or as I mentioned: we would be talking about the consumption of post-training ethanol and the evaluation of the response of the body to the intake of X or Y amount of this substance (beers contain this type of alcohol). READ: which protein supplement should you take if is your first time? Before continuing, I would like to remind you that ethanol is simply a strong, colorless, flammable liquid that is obtained through the fermentation of vegetables such as grapes, beets, potatoes, among others, and is often used for the preparation of beverages as Wine, beer, vodka, brandy, among many others. FIRST STUDY: "Effect of alcohol consumption on muscle damage and on the performance of the body in terms of muscle recovery and inflammatory capacity in women, after a resistance exercise session." Purpose of this first study: to investigate the effect of acute alcohol consumption on the performance of muscle recovery assessed by maximal mechanical muscle twisting, and the inflammatory capacity assessed by lipopolisaccharide-stimulated (LPS) cytokine production after muscle damage from resistance exercises on women. Methods: 13 women who used to train at the amateur level were evaluated. These women underwent 300 repetitions of the exercise known as leg extension. After this training session, some were provided with ethanol equal to 1.09 grams per kilogram of lean body mass (lean muscle mass), and others were provided with a placebo drink (without ethanol). Keep in mind that blood samples were taken both before and after the training session. In the case of post-training blood samples, these were taken in 3 opportunities: 5 hours later, 24 hours later and 48 hours later after workout session finished. These blood samples were analyzed by the production of LPS-stimulated cytokines (lipopolysaccharides) of which we have TNF-α, IL-1β, IL-6, IL-8 and IL-10. And the maximal torque production, both concentric, eccentric and isometric, were measured by performing this same exercise (leg extension) both 24 and 48 hours later. Results: Although the training session increased the production of some cytokines such as TNF-α (% change from PRE uptake: 5 h-POST 109%, 24 h-POST 49%, 48 h-POST 40%) and one Decrease in the production of cytokines such as IL-8 (5 h-POST -40%, 24 h-POST -50%, 48 h-POST: -43%) and IL-10 (5 h-POST: -37 %; 24 h-POST -32%; 48 h-POST -31%). Consumption of the above amount of ethanol did not affect the body's anti-inflammatory and recovery responses. Regardless of the consumption of this type of alcohol, the concentric, eccentric and isometric torques produced by the legs were smaller at 24 h-POST (106 ± 6 Nm concentric, 144 ± 9 Nm eccentric, isometric 128 ± 8 Nm, M ± SE) compared to the PRE torques (concentric 127 ± 7 Nm, eccentric 175 ± 11 Nm, isometric 148 ± 8 Nm). Conclusions: The amount of alcohol (ethanol) consumed after this and perhaps other muscle endurance exercises does not appear to affect the inflammatory capacity and / or recovery of muscle performance in women. In combination with previous findings in men (following study), these results suggest a gender difference with respect to the effects of alcohol on posttraining recovery, perhaps drinking beer or another alcohol drink could affect more the muscle recovery in men than in women. SECOND STUDY: "Effect of ingestion of alcohol on the cytokines stimulated with lipopolysaccharides, after performing endurance exercises". Purpose: To examine the effect of alcohol in the stimulated production of lipopolysaccharide (LPS) of IFNγ, TNF-α, IL-1β, IL-6, IL-8 and IL-10. Methods: men with an amateur training level (n = 10, 25 ± 3 years, 177 ± 7 cm, 83.8 ± 15.7 kg, 14.8 ± 8.5% body fat) and females with an amateur training level (n = 8, 23 ± 2 years, 161 ± 3 cm, 59.5 ± 6.0 kg, 26.5 ± 3.0% body fat), who completed two identical training sessions performing exercises such as the free squat with barbell on the trapezius muscle (6 x 10 to 80% 1 maximum repetition). Followed by ingestion of alcohol (ALC, 1.09 g of ethanol per kg of fat-free muscle mass) or water (PLA, placebo group). Blood samples were collected prior to the training session (PRE), and also at 3 h (3 h) and 5 h (5 h) post-exercise, stimulated with LPS and analyzed for IFNγ concentrations , TNF-α, IL-1β, IL-6, IL-8, and IL-10. Results: There were no time-dependent beverage conditions for IFNγ, TNF-α, IL-1β or IL-10. Regardless of the condition, exercise resistance induces an increase in IFNγ, TNF-α and IL-1β at 5 h compared to PRE but a decrease in IL-10 at 3 and 5 h compared to PRE. For ALC, IL-8 was reduced at 5 h compared to PLA. From PRE to 3 h, IL-6 was reduced for ALC, but increased for PLA; Resistance exercise induced an increase in IL-6 for both conditions after 5 h post-training. Conclusions: Resistance exercise with heavy loads increased the production of IFNγ, TNF-α, IL-1β and IL-6 and decreased IL-10 production. Alcohol ingestion after resistance exercise affected aspects of inflammatory capacity (production of IL-6 and IL-8). It appears that some of the previously observed effects for alcohol ingestion alone in LPS-stimulated cytokine production were overwhelmed by response to resistance exercise. READ: Best exercise to include in your workout to gain more muscle. So, is it bad or not so bad to drink beer after workout session where yo lifted weights? The ranges of alcohol (ethanol) in a "normal" beer range from 4 to 5 grams. If your amount of lean mass (muscle mass free of fat) is for example 30 kg, then this amount of alcohol is very insignificant for the processes of muscle recovery could be affected. Even if you consume a total of 1 gram of ethanol per kilogram of your lean mass, in this case, for example, if you drink between 8 and 10 beers after working out, it may not be as problematic for Muscle recovery after training if we consider the previous study. However, I am not saying you should get drunk after exercising because you have to bear in mind that alcohol itself is a toxic and therefore harmful to health. Perhaps not so much if you consume it sporadically drinking of beers or another drinks, but if you take it as a very frequent habit and if you take it in high quantities per unit of time, then it will be harmful for you short or long term. Also note that the effects of alcohol intake were more noticeable in the groups that performed the repetitions with heavier loads of the more complex exercises (Free Squat with Bar: second study). Therefore, the greater muscle groups involved in the exercises performed, and the greater the intake of alcohol through different drinks is, the lower the body's anti-inflammatory response and thus the more muscle recovery processes will be delayed. In addition to having low levels of alcohol to prevent muscle recovery processes from being adversely affected, beer contains good amounts of B-complex vitamins, as I mentioned in the second paragraph of this article. And of course a beer contains good amounts of water to promote rehydration, and also contains decent amounts of carbohydrates to stimulate muscle recovery processes through the "filling" of glycogen stores that may have been left in slumps after The weight training routine. But beware, remember not to abuse and not take 10 or more beers after your workout routine even when it was light beers (well, you should drink less actually), because although beer is low in sugars (simple carbohydrates), alcohol levels will become relatively High if you take a lot of these beers, and this factor of "jamming" with this drink could slow down the recovery processes (in your muscles and nervous system mainly). So one or two beers after the workout session would not be bad if you want to calm this craving. But of course there are better drink choices to take after training like protein shakes, and mainly fruit and vegetable juices. Because the problem with alcohol is that excessive amounts of it tend to inhibit the production of the hormone known as Aldosterone, which regulates the maintenance of sodium, the amount of potassium in the blood, and therefore when it is inhibited the body tends to lose a lot of water, sometimes also many minerals, so the body would be suffering in a negative way from excessive consumption of beer. Then keep in mind that if you urinate a lot when you consume a lot of beer It does not mean that your kidneys are being cleaned (as it is vaguely believed), but this is because you are losing much more water than you are ingesting due to the many beers you consume after exercising and / or at another time of day. First study: Eur J Appl Physiol (2017). Effect of alcohol after muscle-damaging resistance exercise on muscle performance and inflammatory capacity in women. Second: study: Danielle E. Levitt et. To (2016). The effect of post-resistance exercise alcohol ingestion on lipopolysaccharide-stimulated cytokines.